One year I bet her that we would be pregnant by a certain date (it was ridiculously close to when we were planning to go off of birth control). She totally didn't think we would be. I won. Another year we bet on something one of the kids was going to do, it was either walking or saying their first word, and I think that she actually won that time. And so each year it has been something new and strange. We haven't even discussed what this year will be but I'm confident that we will be soon (especially because I wrote this post). Cami: "What are we going to do tonight?" Tyson: "Watch that awesome movie we just got from Netflix!" Tyson: "What? You don't want to watch it?" Tyson: "Then what do you want to do?" 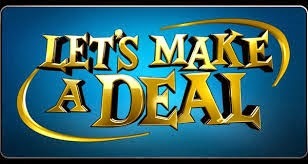 Tyson: "How about I make you a deal?" Cami: her eyes light up and in an excited child on Santa's lap voice "Okay! What is it?" Tyson: "We watch the movie and I will brush your hair." When she wants to do something and I don't the deal is usually that I get a back rub or a shoulder massage. The beauty of our system is that we both love it and we both get something we want. We were negotiating. Marriage isn't about compromise as we so often are told. Marriage is about cooperation. It isn't a zero-sum game where when someone wins the other has to, therefore, lose. When we cooperate it becomes a win-win situation. This is good negotiation as well. The key to any successful negotiation is an exchange of value where both parties are satisfied with what they gave and what they received. It becomes even easier to "negotiate" in marriage because not only are we interested in a successful resolution we love each other profoundly and willingly sacrifice something to make the other happy. 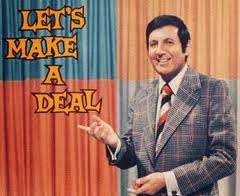 Next time you and your spouse have differing ideas on what to do play the home version of "Let's Make a Deal." Sounds pretty good! Sean likes to watch significantly more tv/movies than I.